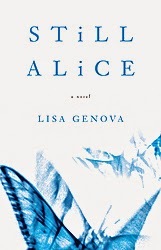 Lisa Genova created a strong and intelligent female lead character in Alice Howland. An intellectual equal to her husband. She is an accomplished author, leader in her field and a distinguished member of Harvard's esteemed faculty. The book spans two years September 2003 - September 2005. During this time we learn about Alice's daily life before Alzheimers, her struggles after her diagnosis and we painstakingly follow her as her mental state deteriorates with each page. Still Alice was a captivating read about an illness that so many, too many, people have to live with. It brings forward the pains, devastation and destruction that Alzheimers disease bestows upon its victims and their loved ones. I adored this book and hope that a cure for Alzheimers will be discovered one day soon. Lisa Genova was one bang on with that line! This was the first book I've read that was written by Lisa Genova and it's instantly made me a fan of her work. The copy of Still Alice that I purchased has an excerpt from her next book Inside the O'Briens. I've already pre-ordered it and await it's arrival on April 7.